For fans of Nintendo kart racers, 1997 has to go down as one of the greatest years in the history of the genre. 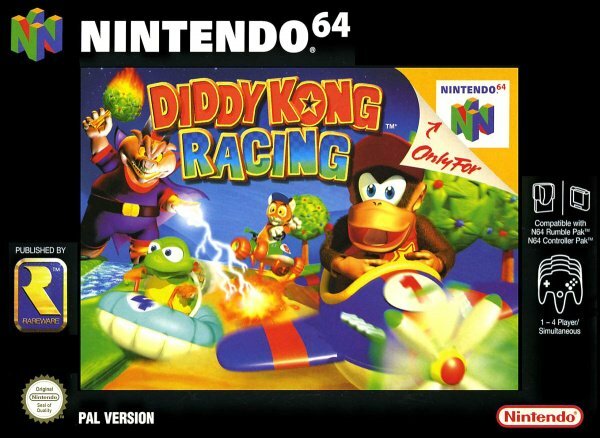 Not only did it witness the European and North American release of the iconic Mario Kart 64, but Rare also introduced their own challenger to the karting crown with Diddy Kong Racing on the same console. Far from being an inferior clone of Nintendo’s timeless racer, DKR manages to differentiate itself from its eternal rival in a number of ways. Most notably, the game offers an innovative mix of adventuring and racing. Featuring a hub world, collectable items, tantalising secrets, boss levels and a storyline - albeit a rudimentary one - it’s clear from the outset that DKR isn’t your typical kart racer. Much like Power Stars granted Mario the ability to explore further into Peach’s Castle in Mario 64, the currency of DKR, golden balloons, allow you to venture further into the island’s different areas. This in turn allows you to enter into an increasingly more difficult and varied series of races, along with the odd boss encounter along the way. While simply winning races isn’t too difficult, especially to begin with, before long the infamous Silver Coin Challenge rears its head and scatters eight special coins around every track. You now have to take part in each race again and not only win, but also collect each coin along the way. In addition, each of the worlds’ bosses must also be raced for a second time, with a more taxing challenge level, and when combined with the coin challenge it is clear that DKR hides a surprisingly stubborn level of difficulty under its outwardly cutesy appearance. Finally, if all of that isn’t enough, anyone skilled enough to completely finish the adventure mode will unlock Adventure Two, which reverses the tracks and places the silver coins in even more fiendish positions. As a result of these challenges, it won’t take long for more impatient gamers to start turning the air a lovely shade of blue. Some may also find it hard to shake the sense that collecting comes first and racing second. 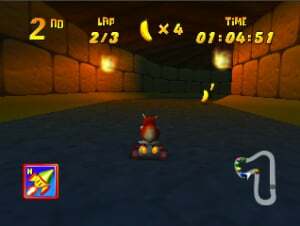 Computer racers never seem to deviate from their set route around the track, and the only thing that makes racing against them difficult is going out your way to collect silver coins. Beyond the challenging single-player quest a range of multiplayer options are also available. These include straight forward racing and hilariously hectic battle-modes, which are sure to keep you and up to three friends entertained. It’s also possible to play through the Adventure mode in two-player co-op, a thoughtful inclusion from the nice folks at Rare. Adventuring aside, DKR is also unique in that it allows you to take control of three different vehicles: the standard car, a versatile hovercraft and a nifty aeroplane. Handling is spot on, as each of the vehicles has its own individual feel and distinctive traits. The decision to include three different types of craft lends a nice level of variety to the game, as it means that the diverse terrains of land, water and air are all available for some racing action. Rare took advantage of these opportunities, as the courses on offer are well designed, featuring colourful backdrops and scenery as well as plenty of hazards and other quirks. Every world that you work through has its own particular theme, such as prehistoric, snowy and medieval, with each including four tracks. These themes, and by association the tracks themselves, are perhaps slightly generic on the whole, especially with consideration that DKR is supposed to take place in the Donkey Kong universe. It’s easy to get the feeling that these could be the courses for any kart racer, not specifically within this franchise. A similar criticism can also be aimed at the game’s ten playable characters. 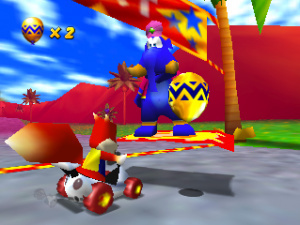 Despite being called Diddy Kong Racing, Diddy is the only member of the Kong clan present in the game. 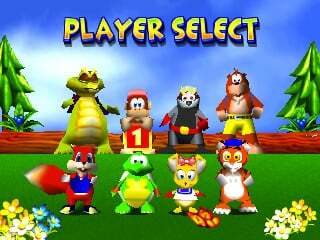 The rest of the cast is made up of a combination of other familiar Rare studio faces such as a Kazooie-less Banjo, Conker (seemingly before he discovered the wonders of alcohol), and unknown characters such as Pipsy the mouse, Timber the tiger and Bumper the badger. Rare were clearly trying to introduce players to new characters in DKR; it would have been better, however, to see a few recognisable old favourites in the game. Interestingly, the DS port, released in 2007 and worth checking out for those without access to an N64, went some way to fixing this issue by featuring Dixie and Tiny Kong as playable characters. However, their inclusion came at the expense of Banjo and Conker, with their copyright status now sadly complicated by Microsoft's ownership of Rare. Visually, DKR is an incredibly vibrant and captivating game, typical of the early Nintendo 64 era. The textures are such that this title looks a little basic these days, but it’s so brilliantly bright and colourful that it’s doubtful you’ll even notice. The soundtrack, composed by Dave Wise of Donkey Kong Country fame, is catchy, upbeat and everything you would expect from a Rare title, fitting the spirit and atmosphere of the game perfectly. Some musical themes are used multiple times for different courses, however, and it would have been preferable if every individual track had its own unique tune to suit the distinct environment. The only real criticism in terms of presentation is that DKR is perhaps a bit too cutesy, especially in terms of the characters’ voices. The fact that the Rare logo appears with the sound of young children’s laughter sets the tone for the audio experience as a whole. Diddy Kong Racing for the Nintendo 64 is a prime example of why gamers should never judge a title by its cover. What initially appears to be yet another cutesy Mario Kart clone aimed at kids not only manages to successfully differentiate itself from its main source of inspiration, but also provides a surprisingly engrossing and stubborn challenge. Make no mistake about it, this game requires genuine skill. There are a few forgettable characters and the environments are perhaps somewhat generic, but Diddy Kong Racing still comes highly recommended. I think I'll stick to Mario. This was superior to Mario Kart 64 to me. And I freaking loved Mario Kart 64. Just too much fun flying around in an airplane, lol. I remember this game and I still have it. I usually choose hovercraft more than a car. It is a good game actually. This, to me, is the greatest kart racing game of all time. Love this game. I need to get a working N64 controller, so I can play this again sometime. I'm sure I remember reading once somewhere that Timber the Tiger was originally going to get his own game. That was before Rare gave up on the platforming genre. This was a great game - but the colors really made me dislike this game. Yeah, a pathetic quip, but that was all that mattered to me: The colors were far too bright. ...I thought that Mario Kart was far better designed. But this brought a unique concept and sold it well. This was a no go for me. I really trie'd to love it but it had a bad frame rate, like many eu N64 games had, making it rather unplayable. Mario kart was better and had a smooth frame rate and was no doubt the best game for me on N64. Wow, just think, one of the stars from this game (Conker) went on to have one of the most troubling and disturbing futures in the history of gaming. Bought this game back in the day thinking it'd be a Mario Kart killer, and even though it kinda was (it had more vehicles, more tracks, more modes, bosses, etc), I just couldn't like it as much as MK64. I don't know if it was the irritating characters, the brutal difficulty (at least for the Wizpig races... the first one took me hours to beat), the tracks or what, but I played it from the beginning to the end and I just never really got into it. I still have it, though. Much better than Mario Kart 64. But only because Rare set out to improve upon Mario Kart 64. I prefer Mario Kart, but Diddy Kong Racing is fun, too. If Conker was going to appear in another racing game, he would be hard to control, due to drunk driving. I loved this game and introduced my son to it a few years ago. We still play it on my old 64. I'd love to see a true sequel in some form or at least see Mario Kart steal a few ideas in the future. A full adventure mode in Mario Kart would be fun. I've always thought that Mario Kart 64 was by far the weakest of its franchise, with its only great feature being the 4-player battle mode. DKR is the only kart-clone ever made that actually stands on its own and rivals MK64. That was the great relationship between Nintendo and Rare back in their golden days, though: yes, Rare took all its starting points and general ideas from Nintendo's franchises (DKR is to MK64 as Banjo Kazooie is to Mario 64, and so on) but they always managed to put an original twist on the product and make it much more than a generic clone. Nintendo invented the Kart-racing genre single-handedly, and in all these years Diddy Kong Racing was the only non-Nintendo kart game that even came close to being memorable. That's saying something about both companies. I liked the upgradeable power ups, adventure system, in-game cheat codes, and the extras. Nintendo please release this for VC as I've never played it, it looks good! DKR was by far the better single player game compared to MK64, but MK64 had the better multiplayer (although Snowboard Kids imo beats it for racing fun). I believe I got 100% in this, mad enough to beat everything. When I was younger and had the time...! ooo I HATED this game. Maybe it was the choppy framerate, the music or the fact that it was basically the only game my brother would play at the time on his N64. Mario Kart 64 was much more enjoyable, and I didn't even like that one. Mario Kart 64 completely lacked the charm of SMK, the 3D graphics were ugly....Even at the time i thought SMK was prettier and more appealing....MK64 felt so lifeless and bland in comparison. It was hands down for me the worst in the MK franchise....I don't understand why people think so highly of it, must of been the multiplayer....Super Mario Kart destroys them all. At the time I remember thinking this was much better than Mario Kart, its a long time since I played it. I recall playing this game into the small hours around a friends house (I owned a Saturn), trying to beat that final race against (I think) a flying pig of some sort and never managing to do so. Way better than the DS version. I always liked it better. They just ruined the character voices in the DS version, and getting out the stylus just so I can get a boost at the beginning was just annoying. I hated this game when I first started playing it but it really grew on me. 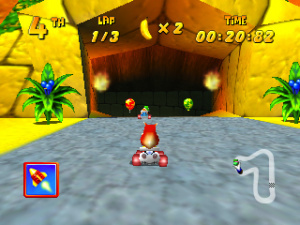 I can honestly admit that while the single player in DKR was a lot better and a lot more fun than in Mario Kart 64, with its uniqueness and cute storyline and all, its multiplayer always felt weak to me compared to MK64, mostly because there were only 2 different battle levels to choose from plus other games to play. If there were a few more battle tracks, I'd probably think differently. Other than that, MK64 felt quite light because compared to DKR it only had basic cup racing and nothing more. Easily the best single player kart game around, with two people it was still pretty incontestable with twinventure and all the other awesome cheats. Four-player multiplayer stacked up pretty well, but when everyone knows MK64 and not so many know DKR it's harder to get a solid group. Great Game! But not equal to Mario Kart. Cause Diddy Kong is in it LOL. The first 64 game I played. Loved it. The hub world was awesome to explore. Always hoped they would make a sequel. While Mario Kart actually has the better selection of items, DKR gains the upper hand when it comes to vehicles (plane, hovercraft, & car), has a wide selection of courses, and a stellar campain mode. It goes along with many of the other RARE titles that focus on object collection. It was always a joy whenever I unlocked a new area. Overall, I never unlocked all courses or beat the game, and I did spend more time overall playing MK64. Although the levels in MK64 contain a bit more polish, there is a lot more content and things to do in this game, and DKR offers plenty of diversions to keep you busy. The DS port is faithful to the original and contains even more areas and places to explore (or maybe I just got further into the game because the boss stages were more forgiving in the DS version), so I recommend tracking down either, both versions of the game are worth hunting down in my opinion. I got both Mario Kart 64 and Diddy Kong Racing with the N64 I bought used. After half a year, I traded Mario Kart away for Holy Magic Century. And inferior game, I know, but fact of the matter was that when I had DKR, I never actually played Mario Kart. To this day, I still think Diddy Kong Racing is better than ANY Mario Kart release. This was no Mario Kart clone. It wasn't just a Kart game it was an adventure game + a Kart game. I preferred it just because there was so much more to it. It was a serious challenge. Even after you beat the game 100% there was then a reversed mode and another silver coin challenge. Mario Kart was good for pure racing/multiplayer but Diddy Kong was a fleshed out experience taking as long as some RPG's to beat. DKR was to Mario Kart what Banjo Kazooie was to Mario 64. I'd say an 8's about right for this game. It's good, but MK64 and CTR are my favorite racers from that generation. I never was a big fan of racing games simply because it never appealed to me to race just for the sake of being first place. Even with the story behind DKR being, as the reviewer said, rudimentary, it was enough to keep me retrying those harsh boss races over and over. That's why i find DKR a better game over MK64. I loved this game and wish we could see a vc release but with copy right issues I doubt we will unless they cut Banjo and Conker. Diddy Kong is my favourite SSBB character too. It's a nice surprise, this game is. 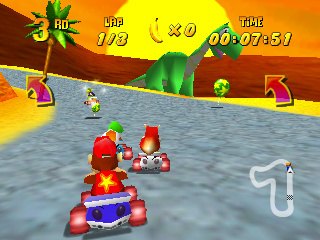 Diddy Kong Racing's multiplayer never took off, that's why we favoured Mario Kart 64. But DKR was pretty good too. The adventure mode was something new, and it was very challenging to unlock T.T. and complete the game 100%. I know DKR was announced just a month before it was released. This was a big surprise and no one had too wait for years to to buy this game. And it was just 100DM / 50€ back then when it was new, a bargain for a N64 title. I loved the crap out of Tiptup in this game, I finished everything with just him. This was the game that Rare released while the very long wait for Donkey Kong Country 4. Rare eventually released Donkey Kong 64. But no true Donkey Kong Country game until Donkey Kong Country Returns. Diddy Kong Racing was an early N64 Game. It was alright, But not the Rare game I had hoped for. CTR FTW! Diddy Kong Racing beats MK64 with its item system and game mechanics, but Crash Team Racing is always the number 1. I´m pretty sure MK3DS won´t have as great game mechanics as CTR, jumping and sliding gave you boosts. MKWii had tricks and sliding, almost like CTR which was great. MK3DS has gliding and no tricks it seems, MEH. This is much better than the horrible DS remake. For me this game deserves a 9/10, it was/is just awesome. But, THIS gets an 8/10!? This game is INCREDIBLY superior to Mario Kart 64 in practically every way imaginable.